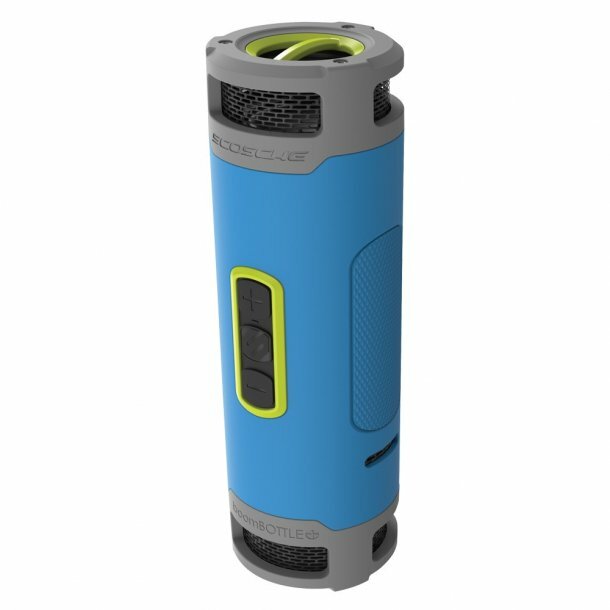 Welcome to the shape of amazing go-anywhere sound and indoor/outdoor music versatility captured in the latest member of the award-winning BoomBottle® family, the rugged, waterproof, wireless, BoomBottle® + portable speaker. This rugged beauty includes exceptional features like two 50mm high-quality speakers, dual pairing for true stereo sound, switchable equalization (EQ) for sound enhancement outdoors and a powerful, internal rechargeable battery for you to charge your mobile devices from the speaker. Equipped with dual 50mm drivers, the integrated omnidirectional diffuser channels music in all directions, creating 360 degrees of immense sound. A large passive subwoofer housed in a tuned and ported enclosure delivers incredible bass. The wireless portable speaker comes with a selectable Indoor/Outdoor EQ function that delivers bold rich sound in all environments. Switch it to OUTDOOR and let the outdoor party begin! Don’t forget to invite the neighbors. Large rubberized front buttons make it easy to skip tracks and adjust volume even when your smartphone or tablet is safely tucked away. Power to play. Power to work! With its 6000mAh rechargeable battery, you’ll enjoy up to 15 hours of continuous music. With BoomBottle ® +, you can quickly charge up your smartphone, tablet or other mobile device while enjoying you music via the 2.1A USB charging port. The portable speaker comes equipped with a ¼ inch thread bottom plate so you can mount BoomBottle® + on a camera tripod or other mounting systems. If you log in, you can share reviews of this product with other users.